IC Insights released its August Update to the 2016 McClean Report earlier this month. This Update included an update of the semiconductor industry capital spending forecast, a look at the top-25 semiconductor suppliers for1H16, including a forecast for the full year ranking, and Part 1 of an extensive analysis of the IC foundry industry (the ranking of the top-10 pure-play foundries is covered in this research bulletin). In 2014, the pure-play IC foundry market registered a strong 17% increase, the largest increase since 2010 and eight points greater than the 9% increase in the worldwide IC market. In 2015, the pure-play foundry market showed a 6% increase, about one-third the rate of growth in the previous year, but seven points higher than the total IC market growth rate of -1%. For 2016, the pure-play foundry market is expected to increase by 9% and greatly outperform the growth rate of total IC market, which is forecast to drop by 2% this year. Figure 1 shows that the top 10 pure-play foundries are expected to hold 95% of the total pure-play foundry market this year. This year, the “Big 4” pure-play foundries (i.e., TSMC, GlobalFoundries, UMC, and SMIC) are forecast to hold an imposing 84% share of the total worldwide pure-play IC foundry market. As shown, TSMC is expected to hold a 58% marketshare in 2016, down one point from 2015, as its sales are forecast to increase by $2.1 billion this year, up from a $1.5 billion increase in 2015. GlobalFoundries, UMC, and SMIC’s combined share is expected to be 26% this year, the same as in 2015. The two top-10 pure-play foundry companies that are forecast to display the highest growth rates this year are Israel-based TowerJazz, which is expected to edge-out Powerchip for the 5th spot in the pure-play foundry ranking in 2016, and China-based SMIC, with 30% and 27% sales increases, respectively. TowerJazz and SMIC have been on a very strong growth curve over the past few years. TowerJazz is expected to grow from $505 million in sales in 2013 to $1,245 million in 2016 (a 35% CAGR) while SMIC is forecast to more than double its revenue from 2011 ($1,220 million) to 2016 ($2,850 million) and register a 19% CAGR over this five-year timeperiod. 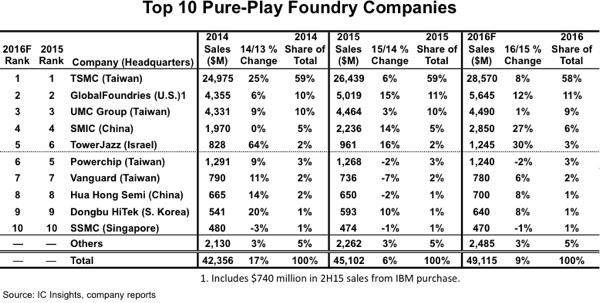 Eight of the top-10 pure-play foundries listed in Figure 1 are based in the Asia-Pacific region. Israel-based TowerJazz, and U.S.-headquartered GlobalFoundries are the only non-Asia-Pacific companies in the top-10 group. While LFoundry is currently headquartered in Avezzano, Italy, China-based SMIC agreed in 2Q16 to purchase 70% of the company for approximately $55 million. Since LFoundry has an installed capacity of 40K 200mm wafers/month, the acquisition of a controlling interest in the company essentially serves to immediately expand SMIC’s capacity by 13% this year. Although SMIC is forecast to register strong sales growth of 27% this year, Chinese foundries, in total, are expected to hold only 8.2% of the pure-play foundry market in 2016, down 5.1 points from the peak share of 13.3% reached in 2006 and 2007. IC Insights believes that the total Chinese company share of the pure-play foundry market will increase through 2020, as the China-based foundries take advantage of the huge amount of government and private investment that will be flowing into the Chinese semiconductor market infrastructure over the next five years. Looking for Semiconductor Foundry services? click here to see a list of semiconductor foundries.